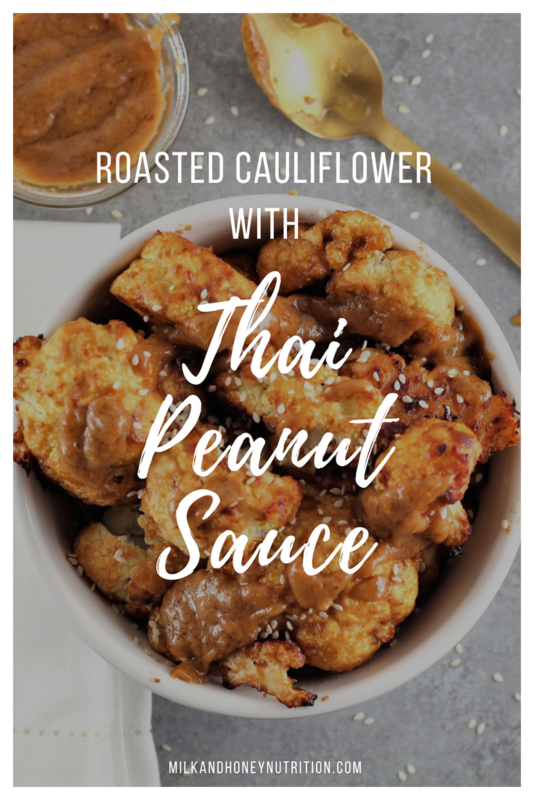 A good Thai peanut sauce is so versatile and this Roasted Cauliflower with Thai Peanut Sauce is no exception! It tastes great hot or cold and can be paired with so many things to make the perfect lunch or dinner! Preheat your oven to 400 degrees, and line a baking sheet with parchment paper. Carefully, slice the head of cauliflower into 1/2 - 3/4 inch pieces. To make the Thai Peanut Sauce, combine all of the remaining ingredients in a food processor or high powered blender and process until smooth. Add the cauliflower pieces to a large ziploc bag along with 1/2 of the Thai Peanut Sauce and shake to coat the cauliflower. Arrange the cauliflower on a lined baking sheet. Bake for 18-20 minutes. Reserve the other half of the Thai Peanut Sauce for dipping or save for another recipe!